It seems the biggest controversy about making one’s own dzem malinowy is whether or not to leave the seeds. As you can see from the photo, I chose to go with seeds. 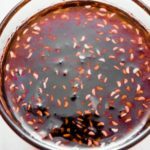 To my mind, if I strain out the seeds and, therefore, the pulp too, I would be making jelly not jam, and I believe that some of the natural fruit pectin would be lost, requiring the addition of something to help it gel. The fresh berries during the summer in Poland are fabulous. I would frequently pick up a carton or two from someone selling at a tram stop, not ours, a busier one where we often had to change trams. They were beautiful, ever so fresh and at 3 – 4 zl, about $1. I chose to stir in a little brandy at the end. 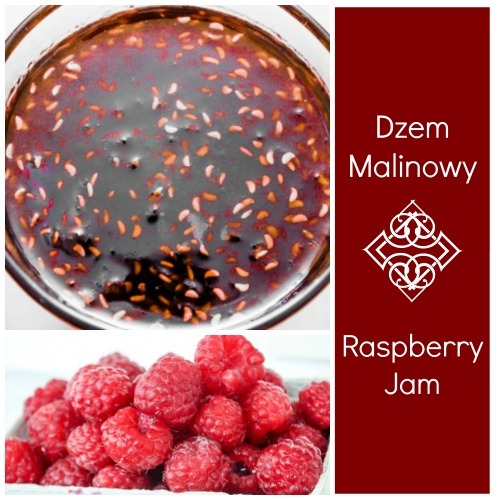 The flavors went well together, and it made this perfect jam to spread on nalesniki, Polish pancakes which are more like crepes than our American version of pancakes. What a sophisticated dessert or sweet for brunch. I’ll try this soon. High season for raspberries here in Connecticut, U.S.A. I am with you on keeping in the seeds! Thanks for sharing such a sweet and simple way to make your own jam! My pleasure, Julie. I know you loved the Polish berries! I love making jam and haven tmade raspberry since we lived in Maine! I also really like all your suggestions for additions.